Spring 1949 arrived as a torrent to the mountains. Rain fell nearly every day for weeks; fields were laid thick with puddles; tractors sat idle. In baseball parks from Old Fort to Hendersonville, players huddled in dugouts, spitting, cussing, waiting for a break in the clouds. Near the end of the first week of April, a handful of them walked onto a field several miles west of Asheville and began playing ball. “Despite havoc played by Jupiter Pluvus [sic] during the past week,” reported the Asheville Citizen newspaper, “Coach Sam Patton will continue workouts this afternoon with his crew of 20 aspirants.” Patton’s workouts were invested with a rare urgency: His team, the Enka Rayonites, had clinched the championship for the Western North Carolina Industrial League the previous season and now the title was theirs to lose. Today, few remember the Rayonites, Beacon Blanketeers, Tryon Raiders, Sylva Plowboys, Canton Pigeons, or Ecusta Papermakers, but between 1935 and 1961, the mill-sponsored baseball teams of the WNC Industrial League were sporting royalty in the mountains. They were followed religiously by local newspapers and packed the stands wherever they played. By day, the players ran looms and shuttles, minded bleach and dye vats, and loaded trucks, alert to the shriek of the plant whistle. But on Saturdays they belonged, body and soul, to the baseball diamond. Shrewd mill owners saw the league as a way of lifting employee morale and creating family friendly events. It was a winning strategy, and a fairly cheap one. “All it took was 15 or 20 uniforms, a pile of baseballs, and a couple bats,” says Patrick Gallagher, author of The Berkeley Spinners: A Baseball History, 1948-1961, chronicling one of the league’s winningest teams. 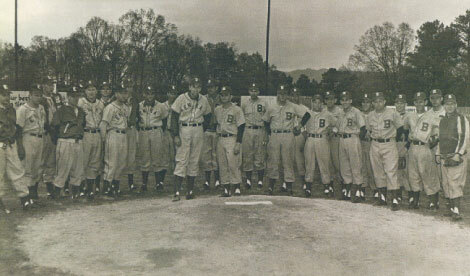 The late ’40s and early ’50s were the high-water mark of baseball league play in North Carolina. Televisions were still rare, and while Yankees and Red Sox games arrived in the mountains through the crackle of radio waves, the social experience of a mill-team game—especially in the baseball-crazed South—was something worth turning out for. As much as a third of WNC Industrial League players had prior minor league experience estimates Gallagher, and as a result, the quality of play verged on professional. “Baseball was about the only thing going back then,” recalls Dewey Hunnicutt, who played 11 seasons beginning in 1948, mostly in right field, for the Spinners. “It was the only game in town.” Along with his brother, Ed, Dewey was a mainstay of the Hendersonville-based team sponsored by Berkeley Mills, which produced textiles and cotton products. In the late 1940s, the Spinners flourished under the direction of Coach Charles “Struttin’ Bud” Shaney, a former star of the minor leagues. In the rainy spring of 1949, the year-old Berkeley team had already lured a half-dozen players away from Green River Mill, including the Hunnicutts. In an act of inspired resourcefulness, that same year Shaney managed to get hold of second-hand uniforms worn by the Philadelphia Athletics. The felt “A” on the front of each jersey came off easily enough—just a matter of ripping out a few stitches—and was replaced with the block “B” representing their new owners. Along with Berkeley, league mainstays included American Enka, Beacon Mills of Swannanoa, and Ecusta of Pisgah Forest. Depending on the year, other teams filling out the league included Clearwater Finishing, Sayles Bleachery, Martel Mills, Champion Paper, and Union Rubber Company. Most players were regular workers at the plants, and only a few were paid extra to play. Many of them had just returned from the horrors of combat. “Sure, you’d have a kid or two just out of high school, but most of us were World War II veterans,” says Dewey, who served four years in the Pacific Theater with the U.S. Navy. During its two-and-a-half decade run, the league produced more than its share of talent. Spinner pitcher Mal Mallette went on to play for Montreal and the Brooklyn Dodgers before embarking on a career in journalism. In 1949, Spinner outfielder Frank Pack played briefly with the St. Louis Browns. “He only had one at-bat, but at least he made it,” says Gallagher. A trademark of the Industrial League teams was their penchant for nicknames. At one time, Beacon’s team had Mark “Red Eye” Ferguson and Bill “Nanner Nose” Barnwell. The Berkeley team had its Oscar “Poochie” Corn, and Mahlon “Cotton” Bagwell, a towering presence at home plate. At their peak in the 1950s, teams like the Spinners were playing as many as four games a week, 50 or 60 a year. Hungry for competition, they would look outside the league for potential foes, challenge college and military teams, and even cross state lines to play exhibition games against minor leaguers in east Tennessee and South Carolina. Championship play took place at big parks like Asheville’s McCormick Field, with the exception of 1948, when a polio outbreak put the city off-limits to public gatherings. But by 1960 the league was down to four teams, as interest in amateur play declined and union contracts put limitations on the mills’ sports programs. The following year, the Industrial League disbanded, and today the exploits of its teams reside mainly in archives and family attics, as yellowed newsprint and dusty box scores. Yet the memories of that period—and more than a little of its swagger—are still alive in a handful of men who once circled the bases. Kent Priestley is the coauthor of North Carolina Curiosities.